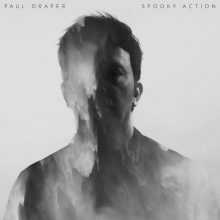 A year after reintroducing himself to the music world with the 1st of 2 EP’s, Mansun’s Paul Draper returns with his debut solo full length album – over a decade in the making. EP1 and EP2 from last year showcased Paul’s writing partnerships with Catherine Anne Davies (The Anchoress) and Steven Wilson (of Porcupine Tree fame). Older, wiser – packing a punch. The lyrics hinted at sadness & hurt – which makes for great songs, even if the experiences were painful. Not one to dwell on nostalgia, the new songs remained true to the Mansun sound while forging a new way forward. It was exhilarating music to listen to, but it made me wonder – could the long-awaited full length Spooky Action live up to expectations? I’ve lived with the album for a bit now, and the answer is a resounding yes. The album opens with Don’t Poke the Bear – a menacing piece of prog rock that boasts an introduction well over the 2 minute mark. Weeding out the casual listeners, I guess you could say. Just as well – when Paul enters the mix with his recognizable emotive vocals it makes the wait worthwhile. Think the challenging aspects of Mansun’s Six with the hooks of Little Kix – you’ve got a winner. “You stole my life / You are a psychopath / Bully for you / For what’s about to happen”. Dark stuff. And we’ve only just begun. Single Things People Want is a perfect blend of optimism and melancholy – with one of the finest hooks Paul has ever put to tape. It seems to tap into that middle-aged sadness that Radiohead explored so well on A Moon Shaped Pool. This, more than any other song on the album, taps into that glorious mid 90’s Britpop sound mixed with glam that Mansun did so well on their debut, Attack of the Grey Lantern. Some of the lyrics sound like new age philosophy – but things that I’ve thought or felt as I’ve entered my 40’s. “I don’t focus on the things that make me sad / the things I will never have / I focus on my simple daily life / I list the things I will never buy / I smile upon the people that I have / The people make me happy, I’m happy”. Simple, but great stuff. And that chorus? “Did I explain / the things people want and the things people get ain’t the same”. Truer words have never been spoken. Who Is Wearing the Trousers boasts a post punk guitar refrain that reminds me quite a bit of Magazine. It takes an unexpected turn where I was expecting a locked in groove – it noodles a bit, opting for the progressive path. Betrayal and hurt – on par for the course w/ this album. You Don’t Really Know Someone, Til You Fall out with Them is the saddest, best, most honest song of 2017. I MAY have been singing it at the top of my lungs the 2nd time I head it on a road trip to Washington DC last month. It taps into that middle-aged sadness again. Locking into a groove with Paul singing the title emotionally – it is truly special. Equal to the best of Mansun. The Inner Wheel ends the album on a strong note – a way forward after the pain explored in the preceding tracks. The lyrics oscillate wildly – from “and learn to live again” to “my outlook is fucked”. A mid tempo track that feels like a meditation. Or rumination. With a coda that closes the circle with Paul’s Mansun days. Perfection. The album is available in various forms here. I really can’t offer up enough accolades for this album – it is amazing. Welcome back Paul. I can’t wait to see what comes next.